Space travel research was supported in New Mexico for most of the twentieth century by a variety of private individuals and organizations as well as federal agencies and state and local government entities. At the beginning of the twenty-first century, the momentum of that support produced Spaceport America. 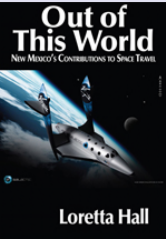 Loretta Hall's 2011 book, Out of this World: New Mexico's Contributions to Space Travel, tells the stories---human and technological---of space research in New Mexico that brought this country from the earliest liquid-fuel rockets to the world's first purpose-built commercial spaceport. From 1930 to 2010: Out of this World in 80 Years. This website introduces you to Loretta and that book, and offers additional insights to the people and events that have made New Mexico a vital resource in the development of space travel. For information about Loretta's 2014 book, Space Pioneers: In Their Own Words, visit SpacePioneerWords.com. Find out about her 2016 book, The Complete Space Buff's Bucket List: 100 Space Things to Do Before You Die, visit SpaceBucketList.com. New in 2017: Loretta's book Miguel & Michelle Visit Spaceport America, for ages 6-10. Out of this World was named Best New Mexico Book in the 2011 New Mexico Book Awards.